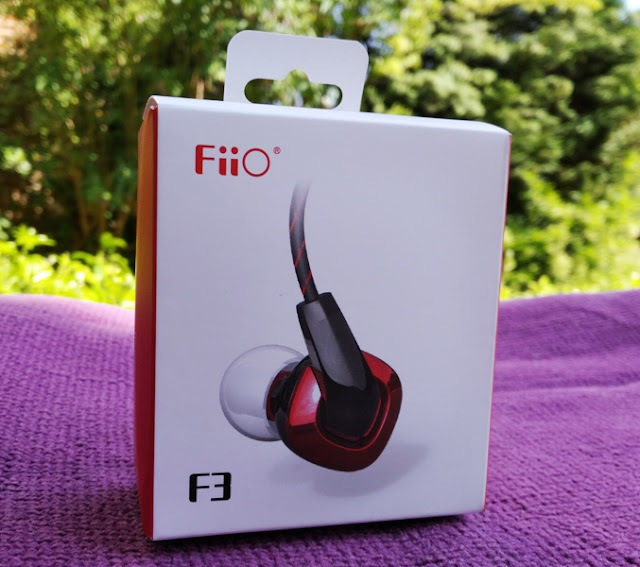 A budget price can sometimes be synonymous of a low quality product but not in the case of the FiiO F3 earphones! 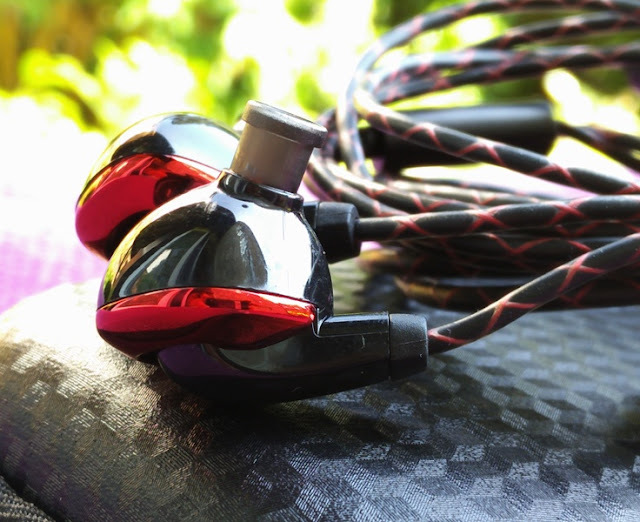 While very affordable, the F3 earphones have a solid construction without skimping on quality materials. 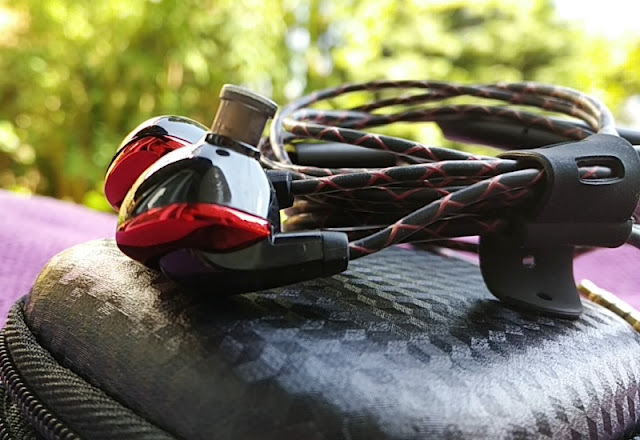 The F3 speaker drivers are 11mm in size and feature diaphragms and voice coils made with graphene and copper-clad aluminium, which are the same materials used in many high-end speaker drivers such as the Zolo Liberty. 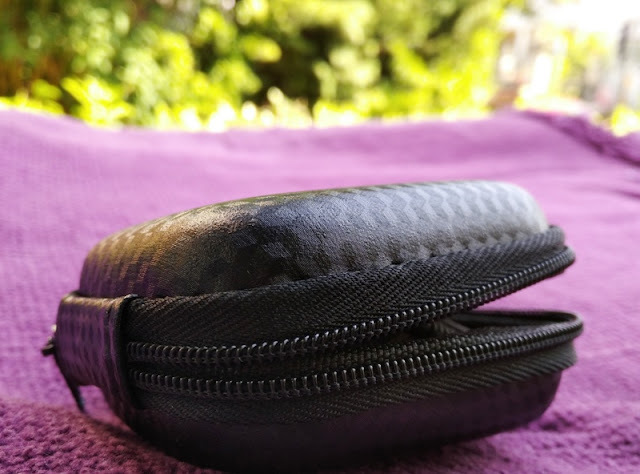 Graphene also does wonders for battery life so power banks such as the ElecJet Apollo integrate graphene cells to increase battery life. 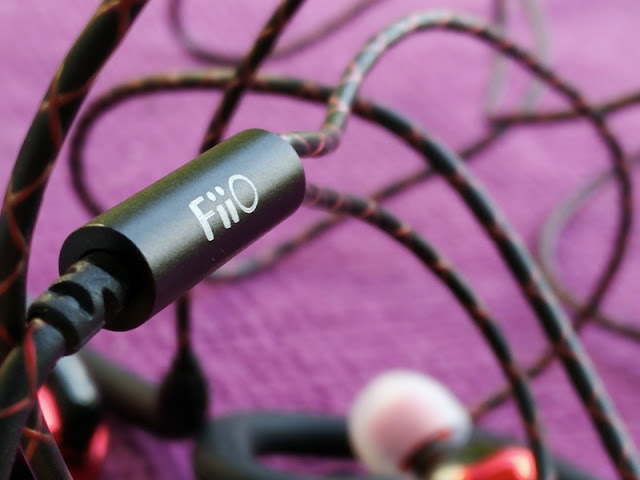 While the FiiO F3 earbuds are budget friendly, the sound quality is certainly high end. Audio reproduction is clean with plenty of detail and a good amount of bass. 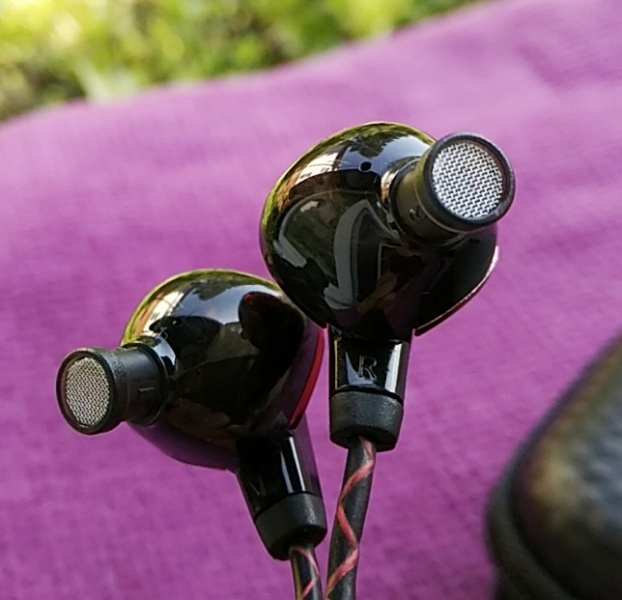 The F3 earbuds have an impedance resistance rating of 40 ohms which is low enough to be driven from a smartphone. 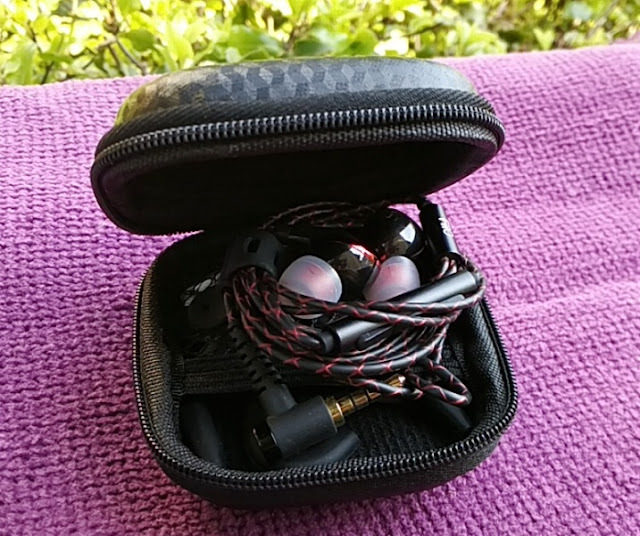 The sensitivity/efficiency of the F3 drivers is 98db/mW which is high; hence you won't need a dedicated headphone amplifier. 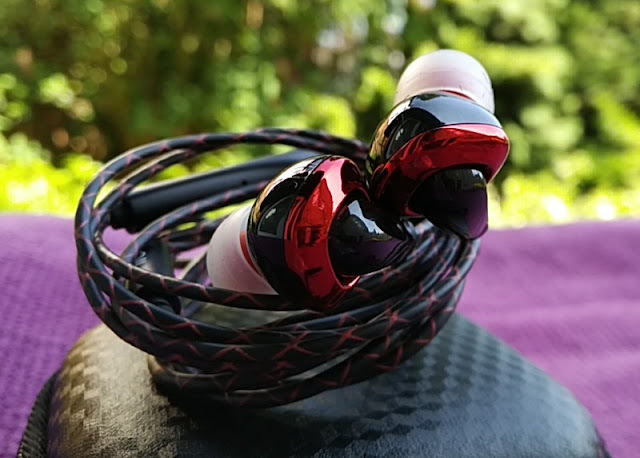 Headphones with impedance above 50 ohms and sensitivity/efficiency below 95dB/mW is considered high impedance and low sensitivity respectively. This means, if your smartphone doesn't have a DAC built-in you will need a headphone amplifier solution like the UAMP. 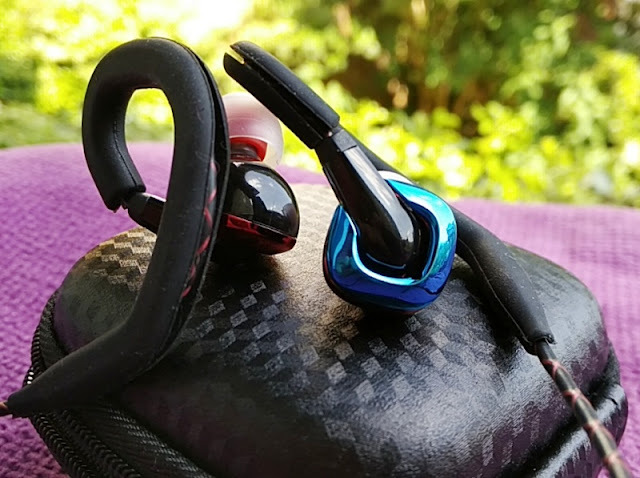 The squarish housing of the F3 earbuds is made of polycarbonate which is the same material used in the making of shatterproof windows. 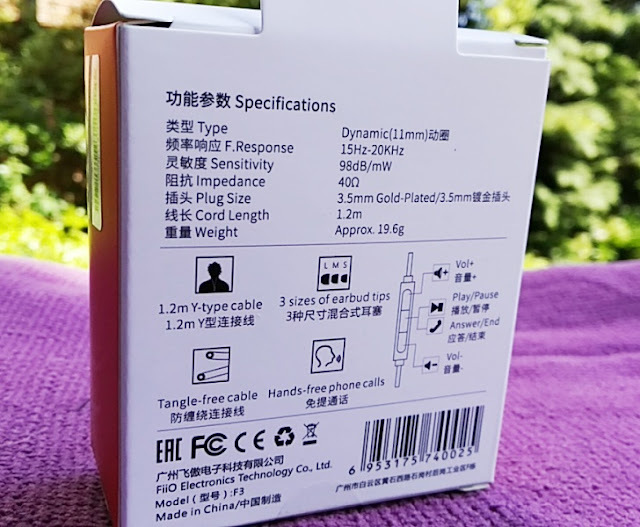 The F3 housing features long plastic nozzles slightly angled downwards. 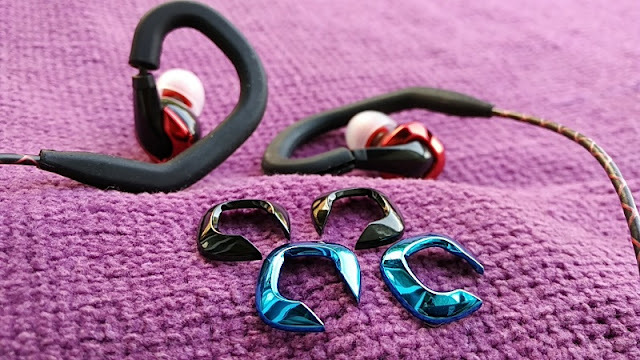 The F3 earphones weigh only 19 grams so they fit comfortably in the ear canal without falling out. 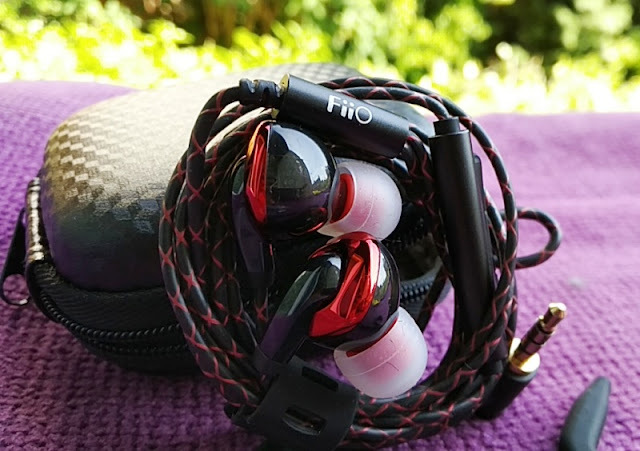 The FiiO F3 earphones design is rather eye-catching and unique thanks to interchangeable colored vacuum-ion electroplated shells that let you change the look of the F3 earbuds from black, red and blue. 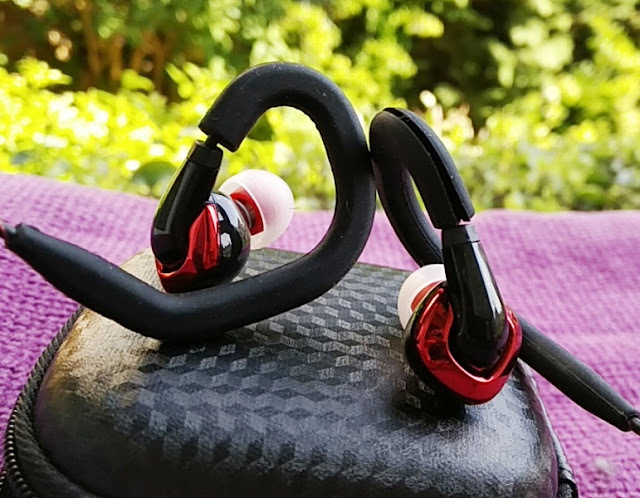 The FiiO F3 graphene earphones integrate also removable over-the-ear hooks that you can easily attach and detach from the cabling for an over the ear style. 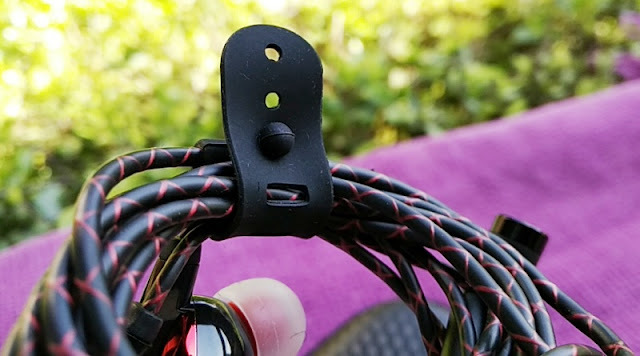 You get small rubber stress reliefs where the cabling meets the earphone housing, as well as a durable 1.2 meter-long cable made of polyurethane (PU). 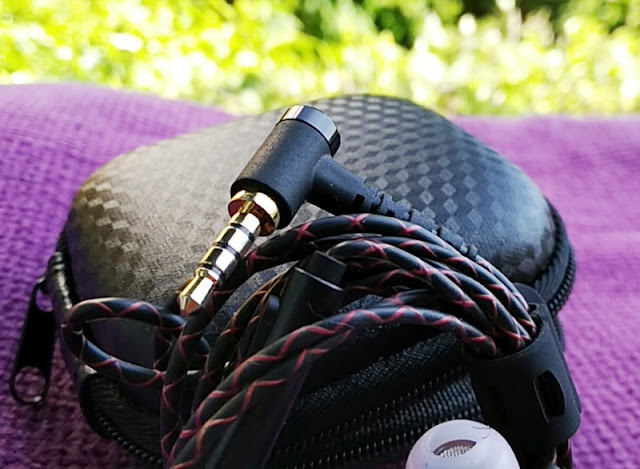 The FiiO F3 cable terminal features a thick L-type (right angle) gold plated plug with a TRRS connector to accommodate the built-in microphone located in the inline remote box. 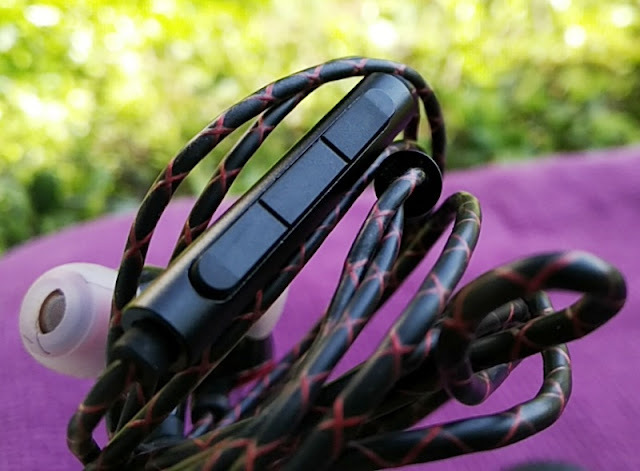 Talking about the remote, which is only compatible with Android phones, is made of aluminum alloy with plastic control buttons which feel tactile and responsive. 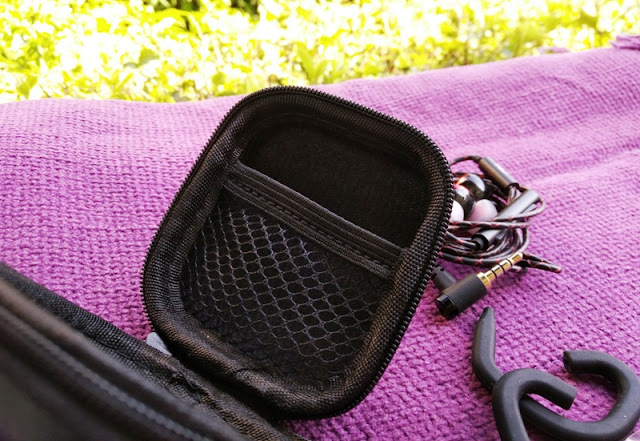 The length from remote/mic box to the earbud is 8 inches (20cm) so the remote/mic dangles over the jawline. The mic quality is pretty good. The middle button of the FiiO F3 remote controls the play/pause of the audio and answer/reject calls. The other two buttons are dedicated volume buttons to volume up and down. 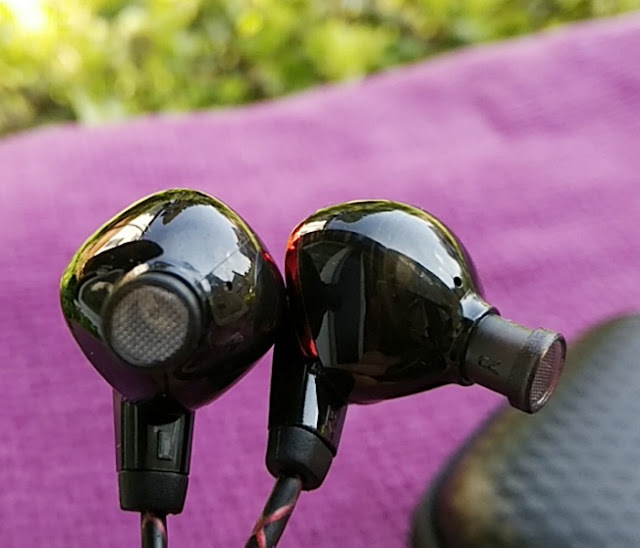 The overall volume sound is pretty good. Reel to Reel Tape Machines Are Impressive! GrovePi+ Project 1: Fading Two LEDs Simultaneously! Seductive Steampunk Look Of Nixie Tube Displays! 2019 Gadget Explained. All Rights Reserved. Gadget Explained Gadget Explained . All Rights Reserved.